We've heard it from the experts: Families don't eat together any more; children don't spend enough time outside; parents and children spend too little time together. Here are two experts who have discovered a time-honored ritual that solves all three problems: Cook a meal — or two, or many — with your children outdoors. 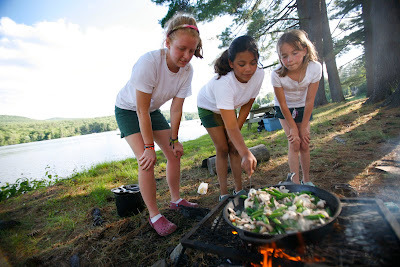 Sara DeLucia, AMC's adventure programs manager, oversees Camp Kitchen 101, an introduction to backcountry cooking that goes from soup to nuts — and also from stove to pot, and water filter in between. She says that cooking outdoors with children presents adults with the "opportunity to be mindful." Be safe. Above all, DeLucia says, be safe. Don't let five-year-olds light stoves. Always treat water before drinking. Demonstrate the principles of the stove, and how to minimize fuel use by having everything lined up ahead of time: food ready to go, water at hand for cooking and cleaning. If using a water filter, let kids take turns pumping to fill pans and bottles. If boiling water, set a five-minute goal and let them watch the clock while the pot boils. Reduce packaging. DeLucia encourages parents to demonstrate how to reduce packaging. She advises them to repackage food into reusable or lighter-weight containers before trips. (Resealable plastic bags are hard to beat for convenience, and can be used to hold smaller, measured quantities of ingredients bought in bulk.) Cut cooking instructions out of boxes and place them with the repackaged ingredients. Label spices and other cooking essentials — you want children to know if they're adding salt or sugar to that pot! Think quick. When planning menus, think of quick-cooking, yet filling foods like pasta and rice. Such simple fare is often the key to turning hungry hikers into happy campers. Leave no trace. DeLucia advises the groups she teaches to leave no trace of their cooking. Use stoves for cooking in areas without designated fire rings or where collecting firewood can harm camping locations. Don't burn trash: Pack it out. Share your knowledge. In all of her tips, DeLucia encourages parents not only to share the chores but to share their thinking with children, as well. Sally Needell has led girls on camping and paddling trips for Aloha Camps in Fairlee, Vt., for more than four decades. "Outdoor cooking is a wonderful thing to do with kids when you have the time," she says. Her camp cookery often results in bonding and lifelong memories that come from silliness, ingenious recipes, and the most elemental of heating methods — an open fire. Because some of her most inspired recipes make use of Dutch ovens, cast-iron pots with tight-fitting lids placed directly on hot coals, they may be more useful on group camping trips or on backpacking trips that set up base camps. "Belly bread." One of Needell's innovations — body-heated bread — has become legendary at Aloha. The recipe begins with flour, sugar, and yeast premixed in resealable plastic bags. Kids add warm water and lightly knead the mixture inside the bags. (Needell recommends bringing a back-up bag of dry mixture to add to bags that become too soggy.) Campers then carry their bags between shirt and skin for about an hour—something they can do even while hiking — allowing the warmth of their bodies to work on the dough. "The dough doesn't rise," Needell admits, "so much as it 'rests.'" To make cinnamon rolls, roll out the dough on a baking sheet or pan with a Nalgene bottle. (Needell's voice of experience: "Check that the pans fit inside ovens before packing them in.") Butter the dough, sprinkle it with brown sugar and cinnamon, roll it back up, slice it, and cook the treats in the Dutch ovens. Another lesson learned from experience: Place several heated rocks inside each oven for more even cooking. And if you want to wake up to warm rolls, nestle the ovens containing the cinnamon rolls in hot coals at the end of the evening. They'll be ready and still warm the following morning for breakfast. Pizza dough can be carried as "belly bread" as well, rolled out, and cooked in a pan or on aluminum foil laid over a fire grate. Pocket stews. Many of Needell's meals are cooked in aluminum foil, a flexible, lightweight alternative to Dutch ovens. She often includes "pocket stews" on camping-trip menus. Campers chop vegetables and add cheese, beans, or meat to their foil "stew pots" as they wish. (Middle school students and older are ready for the jackknife safety talk. "If you've got the time, it's a teachable moment," she says.) Kids can twist and fold their foil pockets into shapes — swans are a favorite — to tell them apart on the coals. Again, the method is as important as the food. The experience is what counts. And as Needell points out, "Everything already tastes better on the trail." "Cast Iron Chef." Needell sometimes splits campers into teams of two or three for a "Cast Iron Chef" competition. She gives them the same set of ingredients and challenges them to come up with tasty new recipes. She's seen the trick — turning a chore (and perhaps a depleted food bag) into a test of skill and creativity — work equally well in small groups, too. Like any good cook, Needell knows that the ritual of preparing a meal together can result in more than simply sharing food, whether the cooking occurs in a fully stocked kitchen or in a camp kitchen. She starts every one of her recipes with the same key ingredient: "If you have the time..."
Read "Backcountry food tips" (AMC Outdoors, April 2009) for more on camp cooking with children. Photo credit: Jordan Silverman, Aloha Camps.